Book this full-day private guided walking tour to visit Nikko, the cultural and historical area, from Tokyo by Limited Express Train. 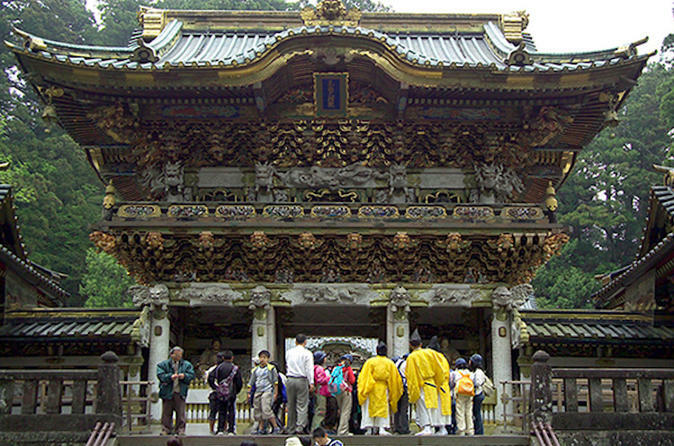 You will see the historical architecture at Toshogu Shrine and hidden part of Nikko while walking. Sake Brewery is also available as an option. Meet your guide at 8:00AM. Arrive at Asakusa Station by 8:50AM and jump on your limited express train heading to Nikko, a beautiful city know for its culture and history. 11:20AM Visit Nikko Toshogu Shrine/Rinnoji Temple. Nikko Toshogu Shrine was built for one of the most famous generals in the Japanese history - Ieyasu Tokugawa. General Tokugawa died in early 1600's and his body was buried in Nikko. His son, Hidetada Tokugawa, built a mausoleum in Nikko, which was completed in 1617. However, the mausoleum was quite small so that his grand son, Iemitsu Tokugawa, re-built it in 1636. Because of this re-building, many craftsmanship, such as carpenter, painter, and sculptor came to Nikko. The construction costed about 16 billion yen (About USD160M) and spent nearly 1.5 years with 454 million people. In this shrine, in addition to Ieyasu Tokugawa, Yoritomo Minamoto and Hideyoshi Toyotomi are also enshrined. Also, there are 8 national treasures and 55 important cultural properties in this shrine. 3:00PM Visit Watanabe Sahira Sake Brewery. Sake is now world-famous Japanese alcohol and you can buy all kinds of sake almost everywhere in the world, but you have to taste the sake at this local brewery. Enjoy the VIP access to Watanabe Sahira Sake Brewery in Nikko and the sake master/brewer will give you tour for you. This is a perfect opportunity to learn A to Z about sake and you will be able to taste some of them. They are making sake between November and March, so you will actually be able to see the sake manufacturing process if you travel in the sake making season.